Woodcliff Lake, NJ – May 10, 2016 – MINI USA is proud to introduce the new MINI Seven, the first special edition of the latest MINI generation which presents a striking combination of the brand’s traditional values and the progressive product quality of the current models. Exclusive design features on the exterior and interior underscore the British origins, hallmark driving fun, premium character and extrovert appeal that make the new MINI Seven a more exceptional phenomenon in urban traffic than ever before. The 2017 MINI Seven special edition will be available in both Cooper and Cooper S variants of the MINI Hardtop 2 Door and 4 Door models in late summer. Pricing will be announced closer to the vehicle’s arrival in market. The name MINI Seven recalls the premiere of the revolutionary British small car more than five and a half decades ago. In August 1959, the virtually identical models Austin Seven and Morris Mini Minor were presented to the public for the first time. The first specimen of the legendary 4-seater created by designer Alec Issigonis and known today as the classic Mini came off the production line as the Austin Seven. The classic body concept is once again represented by the new MINI Hardtop. A re-interpretation of traditional design features gives it an unmistakable appearance. In the interior - likewise designed in hallmark brand style - there are four seats and an 8.7 cubic-foot luggage compartment. Thanks to its high-quality drive and suspension technology, typical MINI go-kart feeling is combined with exemplary efficiency and optimized ride comfort. The original in the small car premium segment is also geared towards the extended requirements of modern target groups with an innovative body concept. In the current generation, MINI is also represented in the small car category for the first time with a fourdoor model. Featuring a wheelbase extended by 2.8 inches, two additional doors, a third seat at the rear and one of the largest luggage compartments in its class, with a volume of 13.1 cubic feet, the new MINI Hardtop 4 Door provides a whole new range of options to enjoy the driving fun that is so typical of the brand. The exterior design features compiled exclusively for the new MINI Seven are geared towards achieving a particularly stylish and striking expression of the MINI Hardtop 2 Door and 4 Door, complete with its characteristic proportions, surface design and lines. Instantly fascinating appeal is created especially by means of a body finish in the MINI Yours color Lapisluxury Blue. This non-metallic finish is the most intensive blue tone ever applied to the body of a MINI. The paint finished conceived for the exclusive equipment program MINI Yours is based on the color Ultramarine, which is regarded as the “blue of kings”. The MINI Yours paint finish Lapisluxury Blue derives its striking brilliance, intensity and depth from the highly elaborate and technologically sophisticated production processes by which the paint and protective layers are applied to the body surfaces. There are three other body finishes available to choose from for the new MINI Seven as alternatives to Lapisluxury Blue. The non-metallic finish Pepper White and the variants Midnight Black metallic and British Racing Green metallic are three of the classic options within the MINI color range in which the characteristic interplay of lines and surfaces on the exterior is given stylish yet discreet emphasis. This also brings out the athletic stature of both the new MINI Hardtop 2 Door and 4 Door models. It is especially defined by the powerfully arched bonnet and the large air inlets in the front apron, the dynamic wedge shape of the side window graphic and a striking sill line that combines with the parallel character line to direct attention to the large wheel arches. The fact that the width of the rear increases towards the bottom likewise contributes to the image of a body sitting powerfully on top of wheels. Regardless of the selected body color, the roof and exterior mirror caps of the new MINI Seven are finished in Melting Silver. This contrasting color available exclusively for the design model underscores the horizontal body structuring typical of MINI, taking in the corpus, glass sections of the passenger cell and roof. The exclusive bonnet stripes of the new MINI Seven are designed to harmonize with the coloring of the roof and exterior mirror caps. The bonnet stripes, also in Melting Silver, each feature a surround in the color Malt Brown on the outside. The 17-inch light alloy wheels of the new MINI Seven were likewise created especially for the design model. With the clear structure of their spokes and two-color finish, the wheels in MINI Seven Spoke two-tone design convey a solid, high-end impression. 18-inch light-alloy wheels are optionally available for the new MINI Seven in MINI Yours Vanity Spoke two-tone. Both variants of the light alloy wheels perfectly match the exclusive exterior features of the MINI Seven with their burnished surfaces and the MINI Yours paint finish Spectra Grey. The interior design created for the new MINI generation is defined by three-dimensionally molded surfaces, high-quality color and material combinations and a modern display and operating concept. A new interpretation of classic styling is reflected in the horizontal structure of the cockpit and the circular or elliptically shaped contours of key features such as the air vents, instruments and door trim. The central instrument - another characteristic element - offers additional display content. Functionality and ergonomics are optimized by the new dashboard on the steering column and the newly positioned controls. In the new MINI Seven, the mature character and premium ambience of the interior is highlighted by a harmoniously matched selection of colors and materials for the seats and interior surfaces. The standard trim includes sports seats in the exclusive fabric/leather Upholstery Diamond Malt Brown, which was created exclusively for this design model. The black leather of the seat and backrest surfaces is combined with fabric in the side sections. The latter have an oblique grey and black check pattern with a discreetly integrated pinstripe in Malt Brown and seams in the same color. The variants Cross Punch Carbon Black leather, Lounge Satellite Grey leather and MINI Yours Lounge Carbon Black leather are offered as alternatives. Other features of the design model include the MINI Seven logo on the trim of the central instrument and interior surfaces in the color Piano Black high gloss. The MINI Yours interior styles Dark Cottonwood, Fibre Alloy and Off-White are optionally available. These options from the MINI Yours program lay the foundation for a particularly stylish and selective customization that underscores the car’s premium character as well as its British roots. In the MINI Yours interior styles, select materials are combined with a precise finish and high-end design. Another accentuation of stylish individuality derives from the Color Line applied to a range of elements from the outer air vents to the vertical surrounds of the controls below the central instrument, also including the armrests in the door panels. In the new MINI Seven, the Color Line comes as standard in Malt Brown, and is optionally available in Carbon Black, a variant exclusively offered for the design model and perfectly harmonized with the other colors used for the interior of the MINI Seven. The launch of the new MINI Hardtop 4 Door made driving fun in the original of the small car premium segment accessible to additional target groups. 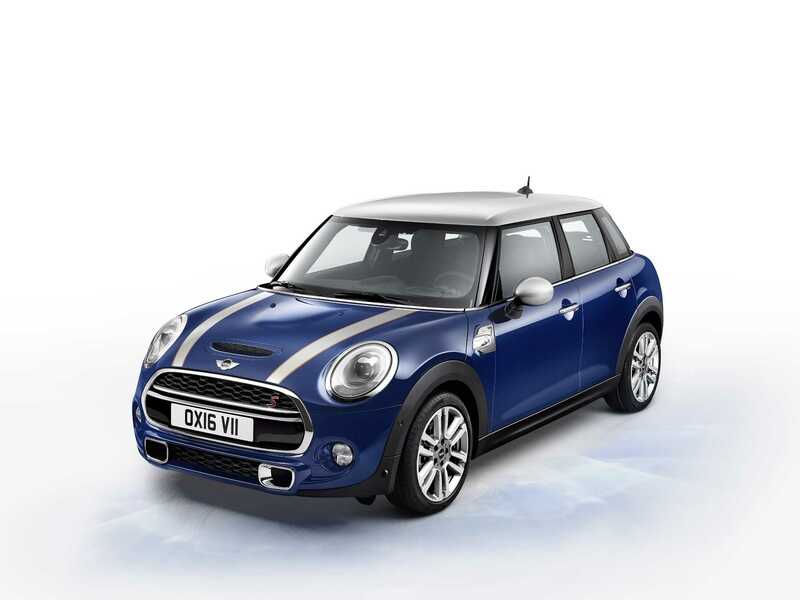 The individual style of the new design comes into its own in both the MINI Hardtop 2 Door and 4 Door models. What is more, the new MINI Seven is available in two engine variants for each body type. The latest engine generation with MINI TwinPower Turbo Technology, likewise newly developed transmissions and extensive MINIMALISM Technology help ensure all model variants achieve an exemplary balance between driving fun and fuel consumption. The engine variants will include the 1.5 liter 3-cylinder engine with an output of 134 hp for the Cooper models and the particularly spirited 2.0-liter 4-cylinder engine with an output of 189 hp in the Cooper S models. For all model variants of the new MINI Seven there is the optional alternative of a 6-speed Steptronic transmission instead of the standard 6-speed manual transmission. What is more, the Cooper S models can also be fitted with a 6-speed Steptronic sports transmission which offers even shorter shift times and includes not just a separate gear selector lever but also shift paddles at the steering wheel. Regardless of the engine type selected, high-quality suspension technology extensively refined and adapted for each specific model of the new MINI generation ensures that the power of the new MINI Seven is transformed into enthralling agile driving properties. The hallmark brand go-kart feeling derives from a single-joint spring strut axle at front, a multilink rear axle, electromechanical power steering and highly powerful and precisely controllable brakes - a combination that is unique in the small car segment. Dynamic Damper Control is available optionally and features electrically controlled dampers which can be adjusted via the MINI Driving Modes. The standard DSC (Dynamic Stability Control) also includes DTC (Dynamic Traction Control) mode and Electronic Differential Lock Control (EDLC) - an electronic locking function for the front axle. The Cooper S models are also fitted with Performance Control, a system that counters any tendency to understeer prior to reaching the threshold level. The standard trim also includes tire pressure display for each individual wheel. Exemplary vehicle occupant protection is ensured by the integrated MINI safety concept which includes not just a body with highly resilient bracket structures, optimized deformation zones and an extremely stable passenger cell but also front and side airbags, side curtain airbags, driver and front passenger knee airbags, 3-point automatic belts on all seats, belt tensioners and belt force limiters at the front and ISOFIX child seat mountings at the rear as standard. The range of driver assistance systems developed for the new MINI generation includes the MINI Head-Up Display, Parking Assistant and rear view camera and also the Driving Assistant system including camera-based active cruise control, collision and pedestrian warning with initial brake function, high beam assistant, speed limit sign detection. The premium character of the new MINI Seven can be further highlighted with other individual options. The highlights of the range of individually selectable optional equipment include the seat heating for driver and front passenger, the panorama glass roof, Comfort Access, the Harmon Kardon hi-fi speaker system, Park Distance Control, power-folding exterior mirrors and auto-dimming rearview and driver’s side mirrors. The new MINI Seven special edition will come standard with the MINI Connected infotainment system including a 6.5-inch high-resolution screen or an optional larger 8.8-inch display with naviation. It offers extensive integration of smartphones in the car, allowing the use of internet-based services in the areas of infotainment, communication and driving experience by means of apps. The MINI Connected XL Journey Mate provides an innovative form of travel planning and support. Operation of all functions is intuitive and reflects hallmark brand style, using the MINI Controller in the center console and the color display up to 8.8 inches in size in the central instrument. The new MINI Seven combines stylish individualism and progressive technology with an awareness of brand tradition and the British roots of the original in the premium segment of small cars. The design model follows in the footsteps of the classic Mini, its name echoing the very first appearance of its legendary ancestor more than five and half decades ago in two virtually identical model versions. This first classic Mini ever produced was an Austin Seven. It left the Longbridge plant in Birmingham, UK, on 4 April 1959. The only features distinguishing the Austin Seven from its twin, the Morris Mini Minor, were the radiator grille complete with brand logo, the hub caps and the body paint finish. Tartan Red, Speedwell Blue and Farina Grey were the names of the colors in which the Austin Seven was available. The entire production of the classic MINI was moved to the Austin Seven’s place of origin in 1969. It was at this point that Mini became the standardized brand name for the small car, which by then had gained worldwide popularity. It was not until 31 years later on 4 October 2000 that the last of almost 5.4 million classic Mini came off the production line - also in Longbridge. Belonging to the BMW Group by this time, the brand had launched a special model of the successful small car a short time previously. Its name: Mini Seven.